In today's fast-paced world, manufacturing and product design teams require a robust, cost-effective solution that delivers a full range of capabilities, keeps them agile and responsive, and provides efficiency and quality. That's why many engineers and product designers choose PTC Creo, a leading 3D CAD application that enables MPD teams to innovate, design and create. But before you can experience the advantages of PTC Creo, you need to understand the computing hardware necessary to deploy it. A comprehensive 3D/CAD/CAM/CAE software popular with MPD teams, PTC Creo enables users to accomplish tasks across the product design timeline: modeling and design, simulation and analysis, smart/connected design, stakeholder collaboration, additive manufacturing, and model-based definition. With advanced capabilities like sheet metal design, reverse engineering, augmented reality parametric and freestyle surfacing, and fatigue analysis, Creo empowers MPD teams to dive right in with a high level of functionality. Extremely flexible, the application improves performance and productivity while optimizing data management and collaboration. For example, users can plug field data into Creo in order to perfect designs. Overall, it's a software with wide applicability across many industries, making a PTC-certified, Creo-optimized BOXX workstation essential. At BOXX, we work closely with our hardware and software technology partners to produce the world’s most powerful, reliable, purpose-built workstations. All of our systems undergo rigorous testing, but for Creo, our APEXX S3 workstation also underwent additional PTC testing to achieve official certification for Creo. The BOXX/ PTC strategic partnership not only ensures ultimate performance and reliability, it also provides expert support and workstation configurations based upon unparalleled knowledge and detailed performance analysis. PTC Creo provides extensive functionality in 3D design and modeling so you can refine virtual prototypes. Fine-tune your designs and models by taking advantage of either direct or parametric modeling and decide your own level of manual control over the most precise details. This flexibility and scale is reflected in specific features like plastic part design, design optimization, and mechanism design, as well as structural framework and weld design. However, these benefits can only be optimized by a workstation purpose-built for Creo. Design and modeling are frequency-bound workflows where only one processor core is utilized. BOXX APEXX S3 workstations are not only purpose-built to optimize single-threaded applications like Creo, they are also tested and officially certified by PTC to maximize Creo performance. With Creo Render Studio Extension, engineers and product designers can generate photo-realistic renderings and control aspects like lighting in order to produce stunning visualizations. The extension is fully integrated within the greater solution, allowing you to switch between modeling and rendering applications. Because hardware focused solely on rendering can actually slow down many tasks, choose a workstation configured to optimize design as well as rendering. BOXX recommends APEXX T3, our 32-core AMD™ Ryzen™ Threadripper™ workstation ideal for both single-threaded and multi-threaded applications. If you’re an MPD professional are on-the-go, choose a PTC Creo laptop solution that can deliver and support desktop-level computing performance. 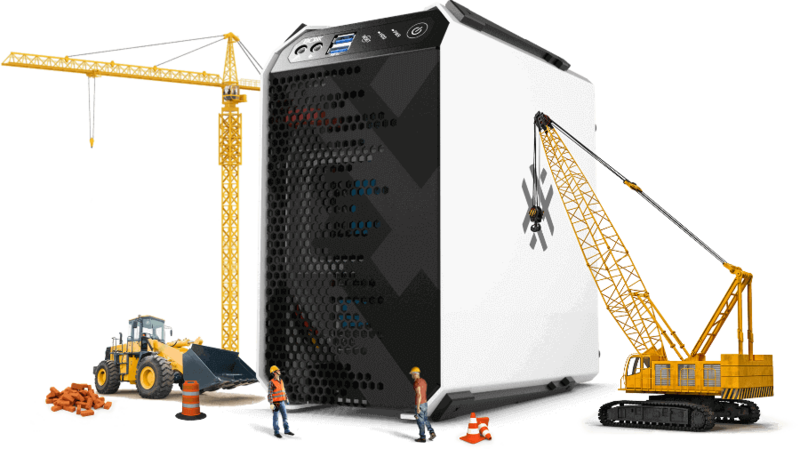 GoBOXX MXL, a true desktop replacement PTC Creo mobile workstation, boasts a 9th gen, eight-core, desktop-class Intel® Core™ i7, 64GB of RAM and NVIDIA® Quadro™ graphics. If you prefer an ultra-thin, run-and-gun solution, GoBOXX SLM features an 8th gen, six-core Intel® Core™ i7 8850H processor, NVIDIA Quadro graphics, and 32 GB of RAM for moderately complex PTC Creo workflows. A compact, high performance mobile workstation featuring a true desktop class 9th Generation Intel® Core™ i7 Processor, professional Quadro graphics, and up to 64GB of RAM. The GoBOXX MXL is ideal for demanding 3D content creation and VR deployment on the go.